Enjoy a restful and relaxing stay at our cottage with more than 1500 feet waterfront beach with a panoramic view of the Murray Islands and beyond! Three bedrooms – sleep six. Lots of privacy, great swimming and clamming. For families with children, we are located within five minute walk from King Castle Provincial Park and close to Brehaut’s Restaurant. Books, games, high speed wireless internet and DVD player. Serene setting and be close to nature..
Serene setting and be close to nature. Both villages of Murray River and Murray Harbour are nearby for gas and groceries, supplies. Terrific Water View from both living room and kitchen of the house. Quiet and private beach is on property ( about 2,000 feet of beach front to enjoy. Automatic dishwasher with detergent provided. Stove top microwave with built-in hood fan. Some for children but who needs toys when open space and nature is your playground? Eagle View Golf Course in Murray River is about 5 minute drive from the cottage. And the green fee is also reasonable. Great week, great weather. Perfect for family. Lots of washed up wood to do a nice bond fire at night with marshmallows for the kids... Short distance to the Kings castle park, where there's plenty of games and even very cheap ice cream... Went for a boat tour one day in Montague which was nice. Would recommend for anyone with kids that wants his little piece of quiet, and lots of space to play! PS : Only small downside was the mosquitoes, lots of them but with bugspray no worries! We enjoyed our stay very much. The cottage was very clean upon arrival. It was well supplied with towels, soap, kitchenware, toilet paper, etc. Everything looked exactly like the photos. Wi-fi worked well. Washer and dryer were perfect. No problems with any of the facilities. Our kids played lawn croquet (a set was left for us) on the huge grassy area. The screened-in front porch was perfect for eating meals without being hounded by bugs. The beach was a fun place for my boys to look for wildlife. They spend hours catching and releasing creatures including: flounder, crabs, hermit crabs, snails, shrimp, clams, oysters, starfish. Every day was a new adventure for them. It was a bit cold for the adults to spend a lot of time in the water, but my kids were fully immersed in the water for hours! At low tide, the beach extends very far out and you can dig for big clams to eat. The only problem was the number of biting black flies (horseflies? ), but that seemed to be a problem in other parts of the island as well. Advice: don't leave anything on the beach. Even though it's a "private" beach, other people can walk to it and there's an RV park just around the bend on our beach. We left an inflatable boat with oars that got stolen, along with a big metal shovel, water guns and a sun shower. It was our fault for leaving our things overnight near the beach, but that still didn't ruin our vacation. We were sad that these items got stolen, but we still enjoyed our beach time nonetheless. 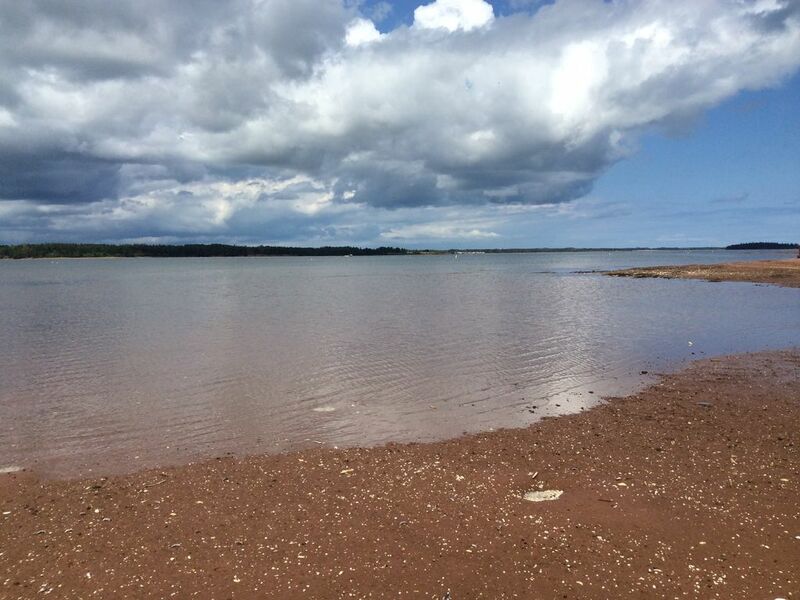 Tip: walk along the beach, around the bend, past the RV park to King's Castle Provincial Park (15 mins.). It's an excellent park for kids. Multiple play structures, including a wooden fort with lookout tower, 3-story metal climbing structure with slides, statues of fairy tale characters and more. My kids spent the whole afternoon here. The best part is that ice cream is only 75 cents for a regular size scoop in a cup or cone. Amazing deal! Overall, we were very impressed with Sonny and his helpfulness. He was wonderful and answered all our questions promptly. Sonny went above and beyond to ensure that we enjoyed our stay. We would recommend this property for other families to enjoy a beach vacation. The water views from the cottage are beautiful and relaxing.